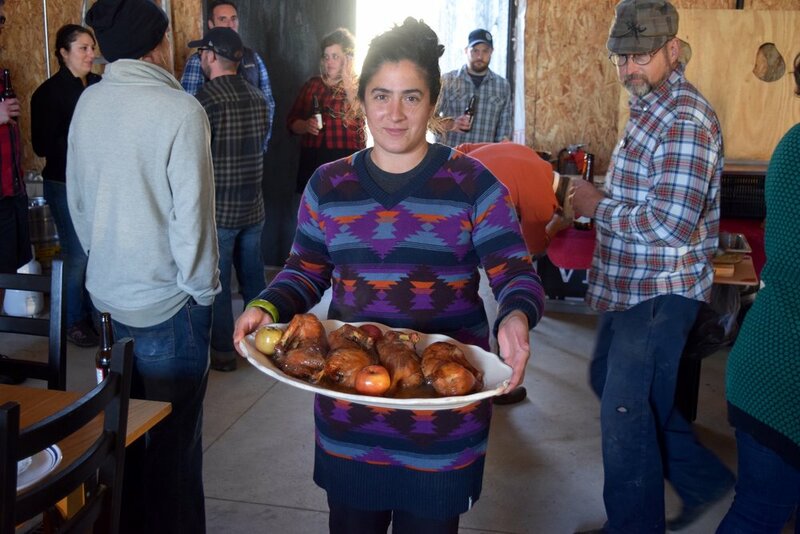 "My favorite holiday is Thanksgiving," says Missy Corey, our farm & hospitality director. She's certainly a master of country and French-inspired food, and being an expert on cooking with and to pair for cider, we wanted to share her ideal Thanksgiving meal and some recipes. "The trick for making Thanksgiving manageable for a smaller number of people is to rethink the bird. So for this dinner, I am focusing on duck. It's delicious, easy to get right, and pairs beautifully with our Michigan Harvest semi-dry cider. I am going to recommend that you order ahead from a quality independent butcher. And since you're there, they'll happily cut the duck in half for you. It's easy for them, and you won't have to wrangle what can be a tricky extra step. From there, roasting duck is as simple as an overnight dry brine of one part each salt and sugar, then garlic, juniper, black pepper, and rosemary to taste. Place in a deep roasting pan with a large dollop of lard and roast in a low oven (300˚F) until legs are loosened and skin is crispy, making sure to baste the duck with that lard every so often to create a crispy crust. The "gravy" is inspired by a recipe from the venerable Anne Willan. It's really just a pan sauce with with Calvados (this time I'm using cider instead), finished with crème fraîche instead of cream. 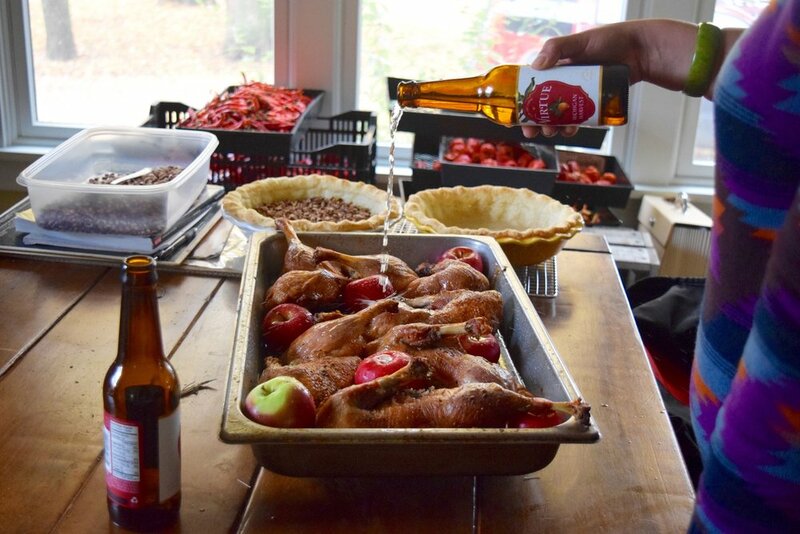 About 15 minutes before the duck is done, I deglaze the pan with cider — such as Michigan Harvest — then add apples and the duck back back into the oven. When the duck is done, I move it to a plate and finish the sauce with crème fraîche for an instant (and delicious) gravy. This recipe is a French classic. 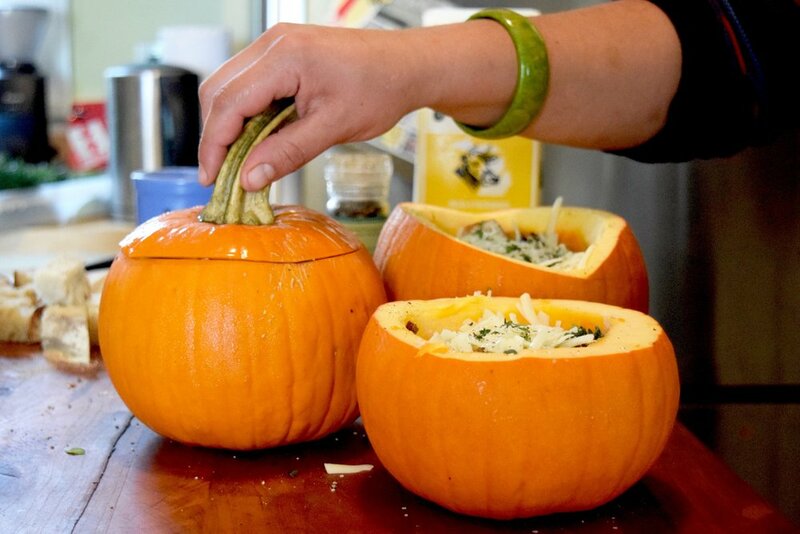 Think of it as an alternative to that crazy green bean casserole that has become such a Thanksgiving icon. This is better, it's actually seasonal, and both times I have made it, it has turned out to be everyone's favorite side. Wash Swiss chard and pull the greens from the stalk, reserving all the stalks. Quickly blanche greens in salted boiling water, until they are just tender, then immediately shock in a bowl of ice water. When fully chilled, wring out all excess water from greens and roughly chop then set in a mixing bowl. Take remaining stalks and slice on a bias, to get lively diamonds. Cut the white onions in a large dice, the same size as the chard stalks. Sauté these together on low with a pat of butter until soft and sweet. Do not allow to brown. When softened, allow to cool slightly and then add to the bowl with the greens. The next step is to make a béchamel sauce. In a separate pot, melt butter, when melted add flour and stir until the two come together into a thick roux. Allow to color but only slightly. The roux should remain golden, but you do want to cook the rawness out of the flour. Add milk and whisk thoroughly. Season with salt and pepper, and a handful of the Gruyère and grate the nutmeg into the béchamel. When thickened and properly seasoned, take 1-2 cups of the béchamel and mix it into the greens mixture. Taste, season, this should look and feel like creamed spinach. Place in a baking dish, top with a thin layer of béchamel and the remainder of the Gruyère. Bake in a 350˚F oven for 35-40 minutes or until golden brown and bubbly. Allow to cool slightly before serving. Pairs well with Percheron. This recipe is inspired by Gabrielle Hamilton of Prune. We held a dinner celebrating a few dishes form the Prune cookbook a few years back. One of the line cooks at the restaurant screwed up the recipe by overcooking the yams, which in my opinion makes the dish even better. Hamilton calls for garnet yams, which are preferable, but to be honest the recipe is so good you can substitute good quality farm sweet potatoes as well. Try it her way, or ours, I like the silkiness of the dish our way and the brown butter vinaigrette makes this dish highly addictive. Hamilton also calls to fry the skins, however in my experience, not many home cooks own a deep fryer and the dish is so luscious as it is, I choose to bake the skins to crips them instead. Pair with Michigan Harvest, serves 8-10. Skin-on, do not pierce. In a hot 400˚F oven until VERY soft. Meanwhile, prepare the brown butter vinaigrette, it is important that the vinaigrette and sweet potatoes be mixed together while the potatoes are still warm. To prepare the vinaigrette, melt the butter in a stainless steel pan on medium until it begins to bubble. Continue to allow the butter to brown, stirring constantly so that all of the milk solids brown evenly. You want to push the limit a little and allow the butter to become nutty and brown. However do not burn! If the butter gets too dark it's best to start over. Allow butter to come back to room temp. Place all other ingredients in a high-speed blender and mix until it becomes a paste. Drizzle in butter, including all browned bits. Add as much vinaigrette to the hot flesh of the sweet potatoes as your heart will allow (I use the entire amount). Take the leftover skins from the yams or sweet potatoes and drizzle with olive oil, and add salt and pepper. Place on a baking sheet lined with parchment and bake until crispy. This will take about 15-20 minutes at 350˚F. Place the crispy sweet potato skins a top the delicious mash and enjoy!